Fundamentals; Network equations; Network theorems; Networks with inductors and capacitors; Network analysis using phasors; The Laplace transform in network analysis; The Fourier series and Fourier transform; The Frequency response of networks; Power dissipation and energy storage in networks; Appendices: Coefficients in the Fourier series; General solution of first-order linear differential equation; Laplace operational transforms; Recommended reading; Answers and guidance to problems. 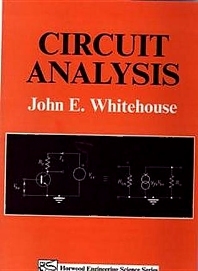 This text presents the fundamentals of circuit analysis in a way suitable for first and second year undergraduate courses in electronic or electrical engineering. It is very much a ‘theme text’ and not a work book. The author is at pains to follow the logical thread of the subject, showing that the development of topics, one from the other, is not ad hoc as it can sometimes appear. A case in point is the application of graph theory to justify the derivation of the Node- and Mesh-equations from the more extensive set of Kirchhoff current and voltage equations. The topology of networks is stressed, again with the aid of graph theory. The Fourier series is discussed at an early stage in regard to time-varying voltages to pave the way for sinusoidal analysis, and then dealt with in a later chapter. The complex frequency is presented at the earliest opportunity with ‘steady a.c.’ subsequently seen as a special case. The use of Laplace transformation appears as an operational method for the solution of differential equations which govern the behaviour of all physical systems. However, more emphasis is laid on the use of impedances as a means of bypassing the need to solve, or indeed even having to write down, differential equations. The author discusses the role of network duals in circuit analysis, and clarifies the duality of Thevenin’s and Norton’s equations, and also exploits time/frequency duality of the Fourier transform in his treatment of the convolution of functions in time and frequency. Worked examples are given throughout the book, together with chapter problems for which the author has provided solutions and guidance.